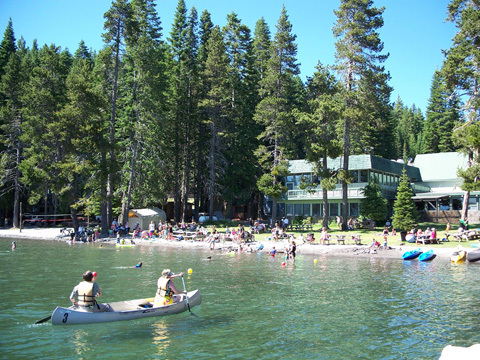 A 10 Year Old's YMCA Summer Camp Adventure. 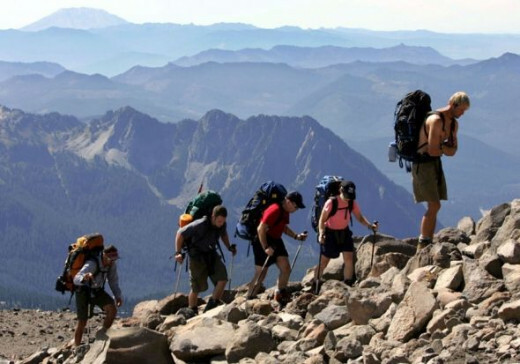 How my introduction to mountain climbing began at a YMCA summer camp is a continuation of that saga I started In another hub, http://campingmannw.hubpages.com/hub/fishinoregon . I mentioned the story of one weekend of salmon fishing trip on the Oregon coast. That story is also of how that ten year old boy's introduction to mountain climbing became a lifelong hobby. An accidental introduction at best and not really much of an introduction as much as it was a seed being planted. 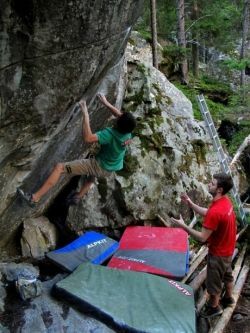 I say that because the beginning of that summer camp exposure to climbing became one of many life lessons learned that have stuck with me since then, even when I wasn't aware of their impact. Would awaken in me years later trout fishing on Diamond Lake and would become my mantra for climbing, hiking, etc. 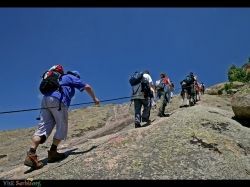 How my introduction to mountain climbing began at a YMCA summer camp is mostly about those memories that left an impression and how those life lessons also become a lifelong hobby. 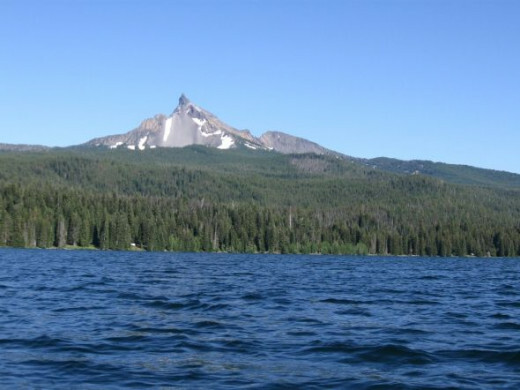 As I said, my introduction to climbing came about during a two week YMCA summer camp on Diamond Lake, Oregon. Now I know there are some reader's here who have fond memories of summer camp and some that do not. In my case, the camp was a fun time and a fond memory. A great memory for many reasons really, but probably the first and foremost reason? It was the first time away from home for a ten year old. At any rate, I was no stranger to the woods, camping out, hiking, or guns.. But.....I was thrown in with a ton of kids I did not know, so there was a learning curve. Harder for some than others, but for the most part, all got along just fine. Like all new things or surroundings, we adapt. So, let's start with some of the basics of my summer camp. For those of you who don't know and for some that want to forget, the layout of the camp was fairly simple. 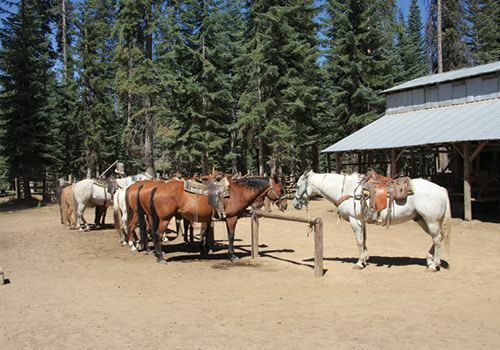 Our individual cabins were generally assigned by age and gender. 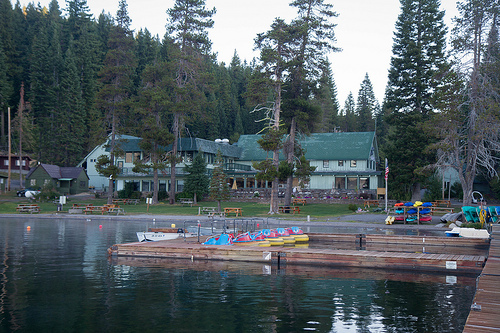 Older kids cabins were further from the center of camp, younger kids cabins closer in. 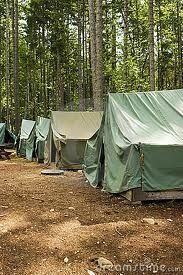 The girls cabins of course were in a totally separate part of the camp but set up in much the same manner. Each days routine was well planned, (mostly to burn off excess energy and keep us busy), but also kept us organized as a group. 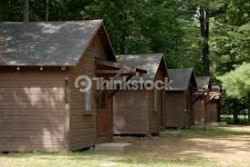 The picture at the right is compliments of "Thinkstock" and is a typical cabin layout. We had cabin cleanup each morning upon rising. Next was washing up, brushing your teeth and dressing and then it was off to breakfast. Once breakfast was over and we had cleared our tables, we headed off to our assigned activity. To keep things lively, each days assignments were slightly different. Boredom and a "routine" were not the order of the day. Believe me, there was plenty to choose from and they varied greatly for a ten year old. Each days activity closed out after dinner around a nightly campfire. A campfire complete with roasted/toasted marshmallows, (Smore's yep, you remember....toasted marshmallows and a piece of a chocolate bar sandwiched in between two graham cracker halves). As everyone settled in after their share of Smore's, toasted marshmallows or whatever, the evening was concluded with an assortment of scary campfire tales. Tales told and embellished by our counselor's. Looking back now, they weren't scary, but at the time? These stories did their job and kept a ten year old with a vivid imagination.....reigned in and in their respective cabins for the night. 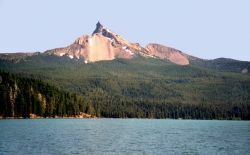 Isn't this picture of Mount Thielsen and it's spire like top, (taken from a boat on Diamond Lake) just beautiful or what? Back to the camp routine......Monday's, Wednesday's and Friday's were relegated to exercise, archery, ( real arrows and everything ) range shooting and gun handling ( yes, we fired real .22 caliber rifles ) hiking, canoeing and crafts. Crafts, yep a class we all had to attend at one time or another to make those multi-colored lace key chains and small wicker baskets for our folks. If you went to a summer camp as a kid, your camp may have offered other "crafts", but on average, these were the standard. Four hours on each Tuesday and Thursday were set aside for a "survival course." It wasn't really a survival course mind you but to a 10 year old? it was great fun. Looking back, I can guess the biggest reason for the change in routine was again, as an energy burner and as an attention diversion. I needed no diversions, as I was excited every day I woke up but didn't mind this change. I mean honestly, what kid didn't think of himself as Daniel Boone or Davy Crockett? The "survival course" was nothing more than our counselor's taking groups of a dozen or so of the boys, (that number depended upon how many kids were in a cabin) and hiking us a short distance into the woods. (probably no more than a couple of hundred yards) Once there, we were taught how to make a "survival camp" of our own. Hey, it was fun and at the end of the day, we felt like we learned something. Arguing over who was going to sleep where and who was going to get to lead us in and out of the woods on our 'camp out' night. Oh and yes, we did burn lots of energy dragging wood, digging the fire pit and dragging rocks to encircle it. Cutting boughs for our beds and the roof. The only tools used were very dull Boy Scout hatchets and knives as well as a couple of old WWII folding Army shovels. After our Tuesday/Thursday "survival course" we thought we were ready to tackle most anything. After all, hadn't we built a great campsite with our bare hands out of nothing? ( not mentioning the counselor's guidance in it all ) Hadn't we used our compasses to find our way in and out of the woods? We were ready! 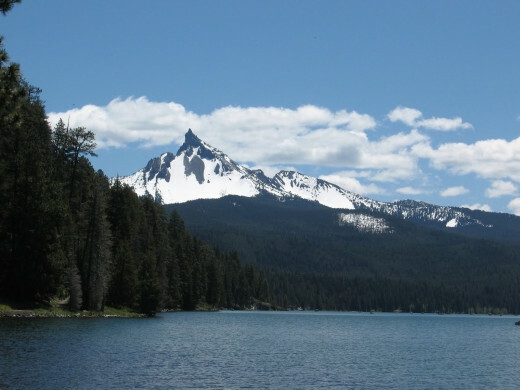 So, when they announced Friday afternoon that there was going to be a big hike up Mount Thielsen, on Saturday? ( a local extinct volcano, visible from our campground ) We fairly scrambled to line up since the number of people ( per age group ) they could take along, was limited. It was first come, first served. I pounced on the idea and raced for the clipboard to sign my name. As I recall, there were no more than a dozen kids allowed in each of the three groups. Two counselors were assigned to each of the three groups. Our group was all 10 and 11 year old kids. Now, to be honest, with all of the activities available? I was having a blast at camp. Every hour of the day was filled so there was no time to be bored. But this Saturday hike was something exciting. Mount Thielsen ( the mountain we were to climb ) was readily visible. 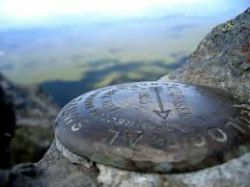 As a group and individually, we began to stare at it and speculate on our route 'up' the mountain. Those of us on the hike told ourselves that we were going to become real mountain climber's. This, while the rest of the camper's were going to have canoe races and swim. Canoe races? Swim? Who could think of swimming or paddling about in a silly canoe when there was a mountain to climb? Really. Little did I know how that hike would become a major part of my life. By 7:00 that Saturday morning, dressed and fed, all three groups of kids were ready to load into the trucks to drive us over to the jumping off point for our climb. 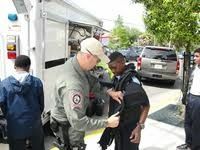 The counselor's each had backpacks with first aid kits, extra water, food, a radio and what not. Each of us kids had a compass, a canteen, a small YMCA backpack with a sack lunch and a spare T-shirt (each of us brought one along), to wrap our fulgarite souvenirs in (more on what 'fulgarite is...later) .This was to protect our trophy's on the way back down the mountain. The anticipation was exhilarating for a ten year old. We were going Mountain Climbing! As we loaded in the different rigs to go mountain climbing, we noticed that there were now three counselor's per rig. One driving, and two others. I wondered why that was? Were they thinking we would get lost or something if there were only two counselor's? Jeeper's, we were survivalists. What were they thinking? To be honest, none of us had any idea what were heading for but the anticipation of "Mountain Climbing" had us all on the edge of our seats as the three trucks headed out. The rigs they took us to the jumping off area were old Dodge Powerwagons, kind of like a big old Suburban of today. Windows all around and seats from front to back. I'll bet there was room for 18 or more people in that old truck because twelve of us and three counselor's and backpacks left room to spare. Each of us, our noses pressed to the windows, were lost in our own thoughts as we watched the lake pass by in between the trees. All of us were straining to keep the mountain in sight. Finally the trees grew too close together, blotting out all view of the lake and mountain. By now, we were on what looked like an old logging road of some kind. (that means 'dirt road.') So we settled back for the ride and jabbered among ourselves. We jabbered about stuff like, who was going to get to the top first, who was going to see a wolf or a mountain lion or maybe even a bear? Our counselors assured us that there would be few if any bears on the mountain and that if there were mountain lions? They would stay out of sight and away from a bunch of noisy kids. Mountain lions were more afraid of us he said than we were of them. HA! Sure! No one believed that. ......our day to Mountain Climb was about to begin! Wait!! Where are the other two trucks? As the truck came to a stop in the parking area, everyone was talking at once and trying to get out of the truck first. Finally, after the counselors had us all sorted out and standing in a row to maintain some sort of order. Order? Didn't he know we were outdoor adventurers? That we had learned survival skills and we were ready for this? It was then that our counselor's answered the main question of where was everyone else (two other trucks) and they told us that each truck with it's climber's had a different starting point and that was why there was only 'us' at this parking area. Thinking back on that day today, it only made sense to split the three groups up. Can you imagine trying to keep track of 36 or more kids all at once on a mountain side? But...back to 'our' climb. Finally, after instructions over and over about how to stay in line one after the other.....smallest to the tallest. The tallest in the front, we were all lined up and ready to go. We were ready for our day of Mountain Climbing. It was at this time, we found out why the third counselor was along. He was the driver today and "driver's" do not climb. He was going to spend the day at the truck, with the radio. The 'radio' was just in case we needed any help. HA! We were adventurers, what could happen to us? We were trained for this sort of thing. So after one more repetition of our last minute instructions, we were allowed to "mount up." Which meant that like the dutiful little mountain climber's we were, we all shouldered our canteens, over our head and down on the opposite hip. ( a quart of water seemed heavy to me in those days ) With our compasses safely clipped to a belt loop of our jeans (for easy access) we then shouldered our tiny backpacks with our sack lunches and T-shirt safely tucked inside.....and off we went single file up the trail behind our counselor. As we headed up the path from the parking lot that morning, a path that would lead us to the trail up the mountain. I can remember turning for 'One last look back' at the truck and our driver. He had already lost interest in us and had set up a small table with an umbrella and a chair. Besides the two way radio, he also had a small lunch bag, a couple of soda's, and an AM radio for music. I saw he was getting things out on the table besides his lunch, a thermos too, a book and a canteen. Whatever was he going to do with all that liquid? I also wondered what he was going to do for the rest of the day and why he didn't want to join our adventure? Didn't our driver realize what he was missing out on? The opportunity of a lifetime we thought. Later, I would learn that the counselor's traded off this responsibility every week of the summer, just to get a break from not only watching kids all day but a break from climbing Mount Thielsen one more time. Apparently they had gathered enough of the fulgarite for themselves, as souvenirs, or whatever. 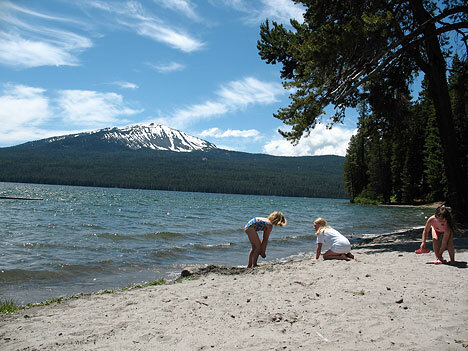 On the other hand, we kids were all on a mission to reach the top of Mount Thielsen. It didn't occur to us that we were not the first to ever climb to the top, what 10 year old thinks of that? All we knew was that our job once at the top was to find and recover those highly prized crystalline creations called fulgarite and we couldn't wait to get there and do just that. 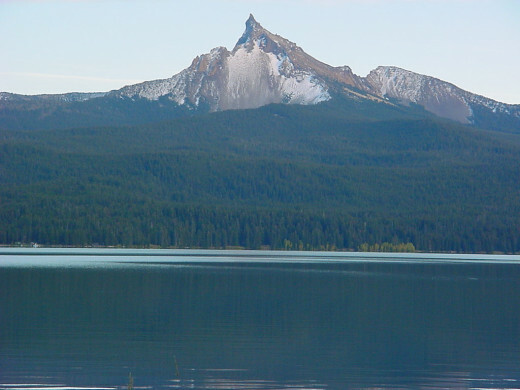 Mount Thielsen itself, has a spectacular horn shape, a shape that had been scupted by thousands of years of glaciers, wind and weather to carve it's current horn like shape. This distinctive spire also acted as a lightning rod for the heaven's and lightning strikes are very common. Hence the abundance of the fulgarite. We, as mountain climbing adventurers, were there to get our fair share of this commodity. But, wouldn't you know, after a couple hours of hiking, the top of the mountain which had seemed so close when we started? Well, it still looked no closer........what was going on here?. At about the three hour mark, We stopped to take a break and to check on one of the kids who was complaining of his foot hurting (primarily his heel). The counselor gingerly felt around his ankle and found nothing wrong. He then proceeded to take off the boys shoe, and then the sock. Once the sock was off, he found the 'cause' of the pain. A big old Blister, yuck! Taking off his backpack, our counselor pulled out his first aid kit and treated the blister right there on the spot. First, opening it so it could drain, then applying a liberal dose of Merthiolate. ( yep....Neosporin hadn't been invented yet ) He then smeared a liberal amount of Vaseline on the blister and finally a wide bandage. Our counselor then took a couple of quick wraps of gauze around the heel and foot to protect against future rubbing and he was done. Quite professional we all agreed. After that short break with copious amounts of blabbering by all kids and drinking of our water, it was time to start again. So, after ensuring that the kid with the blister could go on, off we went once again. Climbing was turning out to be work and our enthusiasm had dropped but we were all still eager to reach the top. Within about an hour of our "blister fix" stop, it was lunch break. Wearily, we all stopped and slumped to the ground. Slowly, we got out our sack lunches and proceeded to eat. The eager beaver's of just a few hours ago had become a haggard looking bunch for sure. But......we had finally broken out of the treeline. Thus, as we looked around, the top looked perceptibly closer than it had before. There was renewed optimism. Fulgarite....here we come. After picking up our trash and making sure that we had stowed everything properly and there was no trace of our passing (other than footprints), we set off once again. The path seemed a bit steeper now, but it did wind back and forth up the side of the mountain. It was evident that real progress was being made. As we neared the top, our merry little band had become somewhat laggard in our formation and the line stretched out for nearly 50 yards. However, the promise of water up ahead kept us going. We were told there was a spring near the top, with fresh water for the drinking. Inasmuch as most of us kids had drank all of our water in our canteens plus the spare water brought by the counselor's, we were looking forward to that fresh water. But, wouldn't you know? As we rounded a turn in the trail, there it was ahead of us blocking our path. A sea of pumice stone between us and the water. Hard as we tried, we kept sliding back every time we tried to climb it. That's a picture of a piece of pumice stone on the upper left. There had to be a way. We were becoming desperate. Our counselor's had been watching us try to get across the pumice stone. 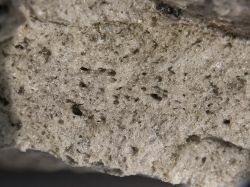 ( if you don't know what pumice stone is, it looks like a rock but is mostly air ). Pumice will however crush underfoot with enough weight. Now, imagine if you will, a trail of pumice stone no more that twenty to twenty five yards across and who knows how many feet deep. This field of Pumice Stone seemed to ring the top of the mountain from what we could see and try as we would, we were getting nowhere. The slope was too steep to traverse straight up and mandated that it be crossed at an angle, we had figured that much out. But we just couldn't do it. Our counselor's who had been hanging back watching us, then took turns explaining to us.In order for us to cross the pumice stone it would take Teamwork. One member helping the next if we wanted to ascend the mountain. Leading the way, our lead counselor took four or five steps up and into that sea of pumice stone. He then turned and stretched out his hand to the next kid in line. Once he had a firm hold of that hand, he turned and took three more steps up as the kid followed sliding some but making forward progress. That kid then turning and taking the hand of the next kid and repeating the process until all of us were snaking across and 'up' the slope towards the water. So, even though it seemed that for every three steps we took forward and we slid back two? We we were making progress. Amazing........To make a long story short, we all made it, but we had learned a lesson about mountain climbing, and a lesson about pumice stone. Teamwork. A lesson remembered years later, Elk Hunting with my Father while climbing a rock face. Using teamwork to do so. Obstacles don't have to stop you......If you run into a wall, don't turn around and give up. Figure out how to climb it, go through it, or work around it. We reached that water by 1:00 p.m. and all collapsed. This mountain climbing business was harder than it looked. We were winded not only from the climb, but from the heat of a summer day as well as the elevation. Once we reached that water, we filled our canteens and rested for about a half hour before continuing to the top. Not completely to the top as I remind you, it has a spire like top. We were however close enough to find fulgarite, and it was everywhere, just as promised. The picture at the right is an example of several of those pieces. We scampered madly to and fro, gathering our prizes while the counselor's watched and made sure we didn't slide away. As I stood holding a piece of fulgarite in the sunlight, my eyes caught the view beyond my fingertips and suddenly........I was spellbound. I had not noticed until right then......I was on top of the world. As I stood there staring out towards the west, Diamond Lake looked so small from up here. Mt. Baldy ( Mt. Bailey ) on the other side of the lake was just a bump. I could see highways and roads through the forest that I had not known were there. It was amazing. I had never been in airplane and this was the highest I had ever been. You could see for miles! Noticing my mouth open gaze, our counselor pulled me over to the side and handed me his binoculars to look through. As I took the binoculars from him, he was pointing down wanting me to look at the parking area where our truck was parked. That truck looked so small from up here. But looking through those binoculars, I could see there were birds on the driver's table and they were pecking away at his lunch while he slept. I could clearly see his head back in the chair, his hat had fallen on the ground and he was going to be sunburned. Fulgarite - Own a piece of the "Lightning"
If you have never seen a piece of Fulgarite or held a piece in your hand, then you are in for a treat. It is one of natures creations that will impress and mystify. It's created when lightning strikes a stone with mica particles (sand) underneath. The result is a fused tube of sparkling fulgarite. 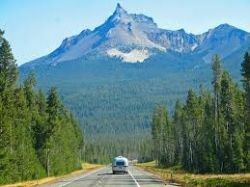 Mount Thielsen is the perfect place to obtain some, as the 'Spire like' shape of the mountain top draws lightning strikes like a lightning rod. if you can't make the trip to climb Mount Thielsen? Here's your opportunity to own a piece for yourself without the climb. Here is a real bargain too, and it's in a display case too. Imagine, your very own lightning created piece of a mountain w/o the climb! Evaluation: Imagine...Your very own chunk of fulgarite to show off. Grab one of these before they are gone. How about a necklace made of the A Sterling silver one of a kind gift for that special someone. Evaluation: A truly beautiful and extraordinary one of a kind gift. Now all of us as a group looked around ourselves in awe. An amazing reward on an amazing day for a ten year old. After we had all had our share of the "view" it was then that our counselors took from their back packs, oranges. One for each of us. I can clearly remember that moment to this day. I was leaned back against that mountain savoring the sweetness of that orange, the view in front of me and the wonder of it all. In that hour or so that we spent at the top, I remember thinking what a magnificent day this was. Probably the best day ever in my short life up till then. After we had finished our oranges and packed away all of the peelings in our packs, ( our packs were now trash bags ) helping though to add to the insulation of our T-shirts wrapped around our prize possessions, (the fulgarite specimens we had gathered), we started back down. The counselor's also taught us that going back down through the pumice that we had worked so hard to climb through? Well it could be fun going down. Taking his backpack off and holding it in front of himself, he turned and popped his feet out in front of himself and slid down through that pumice on his keester. Reaching the bottom of the pumice stone he then turned and encouraged each of us to do the same. One at a time we followed suit, backpacks clutched firmly to our chests, laughing ourselves silly and I remember thinking "What a great day this was" as he caught each and every one of us laughing and tired kids. The hike down was much quicker than the hike up obviously, and we reached the truck in time to wake our driver. Our driver, who yes, by this time had a good sunburn from losing his hat while he slept was grumpy. The birds too had done a number on his lunch. They just trashed it all over his table and had even pecked his orange. What a hoot to see. We helped clean it all up and packed our truck. One of our 'climbing' counselor's drove us back, as our original driver was being tended to for his sunburn by one of our climbing counselor's we victorious mountain climbers were lost in our own thoughts. It was an exhilarating day full of memories for a ten year old. Memories of an adventure, that would be reawakened years later and turn into a lifelong hobby. I hope you have enjoyed the story of how my introduction to mountain climbing began at a YMCA summer camp as a ten year old. 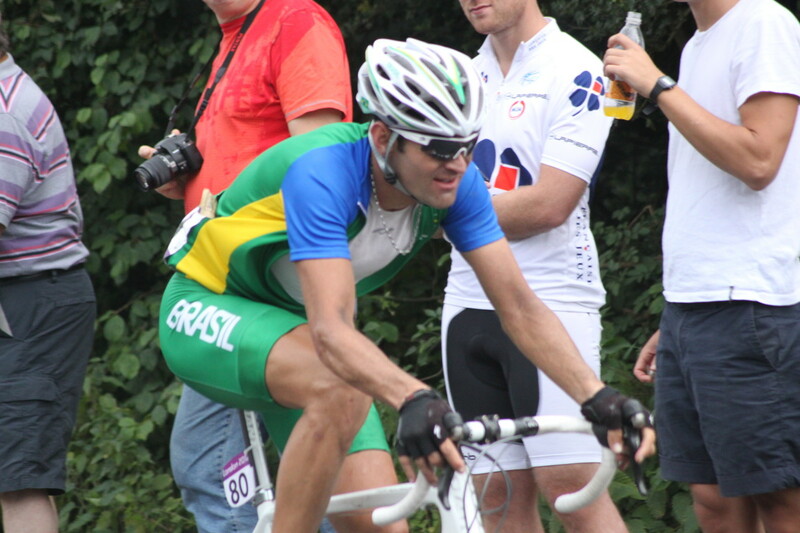 Of how that fascination with that one day mountain climbing experience would affect my life. Our "Mountain Climb" that day, required no special tools or gear, since we were just kids attending a two week YMCA summer camp. Plus, since we did not actually climb to the very peak of Mount Thielsen we cannot really say we climbed to the top. We were not equipped to do more than we did, hike up a Forest Service trail to the vicinity of the spire that is the horn of Mount Thielsen. Our climb was virtually a trail hike that allowed us to be near the top of a mountain and in the vicinity of the Fulgarite crystals left over from lightning strikes. It was the adventure of a lifetime for a ten year old. The lessons learned that summer day in using Teamwork, the counselors Knowing what to take along not just for safety, but for kids.The counselor's Knowing the territory and taught us to leave the outdoors as we found it? It simply fortified what I had been taught by my own Father and Grandfather. Well, those simple lessons have stuck with me to this day. The counselor's also knew we would probably drink all of our water while mountain climbing, (which we did.) But they knew where to find more. Another lesson learned. 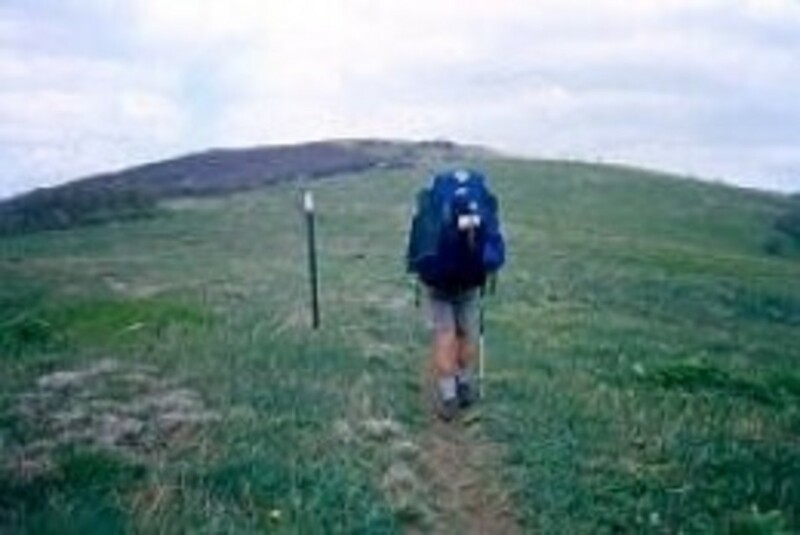 Know the area you intend to hike. A late afternoon snack as simple as an orange to replenish a young kid's energy. They provided those oranges, not only for the moisture or the sugar or even to fill our stomach's a bit. It was the simplicity of the orange as a gift to us when we needed it. Having fun, while being safe-----All great lessons from that day and built upon since. If you have read any of my blogs, then you know my motto: "Plan your trip, Plan your gear and Plan your exit." It's been my mantra for years and years. Just something I share with each hiker/climber I meet along the way, over and over. If I can in some small way, pass along my skills to the next person to help them? Then the journey has been worth every step. So there you have it, but the one thing....What you.the reader....didn't know until today...........was where I learned that mantra.....of....Plan your trip, Plan your gear and Plan your exit was learned that day from those counselor's. @topclimb lm: Well thank you. I don't climb professionally, but have been a climber for many years. Glad you enjoyed the lens. Cheers and thanks for stopping by to leave a comment. I have been a professional outdoor guide-mostly climbing- for 35 years. This is lens brought back a lot of memories for me. Thanks for taking the time to create a great lense! @mel-kav: Thank you for stopping by. Glad you enjoyed the read and I thank you for your comments. What a great story!!! I really enjoyed reading it. @SavioC: Thank you for your comments. As for writing it as if it happened just last week, it helped that as a kid, I kept a diary and that is but one entry from the diary. But the lifelong passion for climbing? It was indeed born of that 2 week long YMCA summer camp and the one day climb. 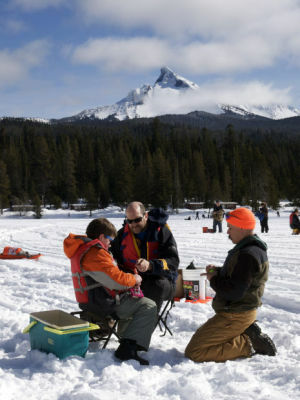 Growing up in my family, camping, climbing, fishing, skiing, boating, and all manner of outdoor activities were the norm, so it was not a stretch for me to pass the same along to my kids. I hope you do try climbing but get in shape first. read up on techniques and most of all, talk with people who climb. Good luck my friend. Hi . You have written this lens as if it just happened just a week back. So much detail. It all says only one thing, "passion" . You woke up that little sleeping giant in me who also wanted to go mountain climbing, camping, fishing...... but somewhere in the growing up process it all got lost. What do I say ? First things first, I ENVY you. Ha ha . 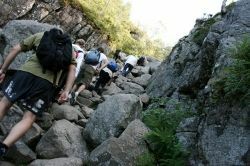 Yes I just promised myself in the next 2 months I am going trekking &amp; mountain climbing . Thanks for sharing this wonderful experience of yours. Cheers man, you just made my day. All the best. @Diana Wenzel: Wow....such great comments. Thank you. Yes it resonated and continues to do so. 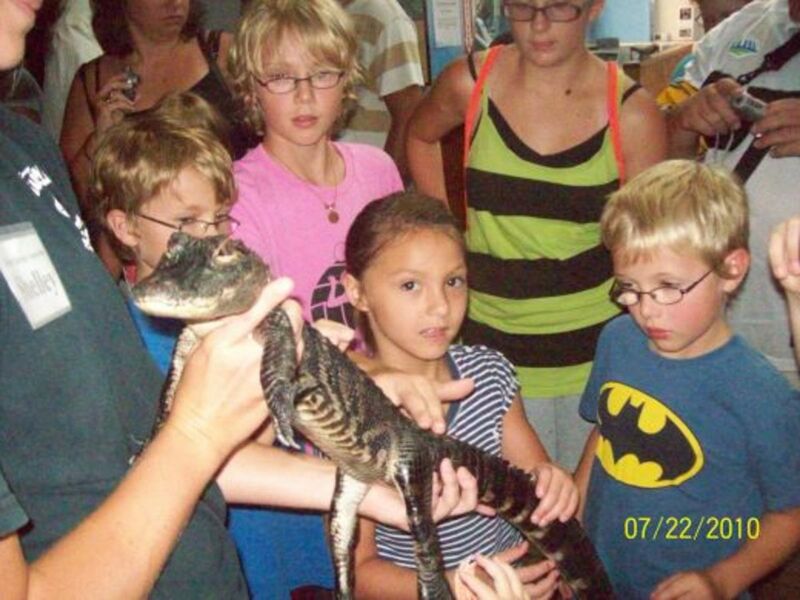 I have passed along the same lessons and hopefully some of the same excitement and magic in experiencing nature to my children who are all outdoors kids. Thank you again and best of luck. I can hear from your writing how formative this experience was and how it forever shaped who you have become (and are becoming). It makes me thankful for the individuals who make these opportunities possible for youth. And now you have the chance to make the same kind of impression on others. Thanks for sharing the importance of this adventure. It resonated greatly with me. Thanks for sharing your mountain climbing story. Hiking and camping weather is coming soon here and I can't wait to get out there! @savateuse: Thank you, I am glad you enjoyed it and I appreciate you stopping by to leave a comment. Very interesting lens! I particularly liked the bit about needing team work to cross the pumice stone. I really enjoyed your story. Camping and hiking is fun, isn't it? @Loretta L: Thank you for your kind words. really, they mean a lot. Yes, it was my first great adventure and like I relate in the story, it was more of a 'hike' than a climb. but hey, to a 10 year old it was high adventure. Thank you again for your visit and the great BIG like? I am glad I enlightened your day a wee bit. Take care. Wow, I love the story of your first ever mountain climb. You are a great story teller. You write really well and we get to see through the eyes of a 10 year old on his first big adventure. I really enjoyed it. It's just the sort of lens I like. If you have more adventures like this you could put them into a book. Excellent. If I were a squid angel I would bless you, but I'm not so I'll just give you a great big LIKE! @RoadMonkey: Thank you. it was, and remains, a remarkable day in my life. I wish to thank you and say I appreciate both your visit and your comments. Great lens, really enjoyed reading the story of your first mountain climb and what a great experience at summer camp! @Girlwiththorns: I am glad you liked it. It is just the musings of a guy remembering a time in his youth. Thank you for reading and for your kind words. I've always wanted do it except for the hanging from a rope part. @eightieschild: Well thank you. I am glad you enjoyed my 'brief' lens. Somehow with editing, it did not turn out to be brief. Thanks for the read, the comments and the most positive suggestion. I thank you again. Well, it wasn't brief, but this is a fascinating read! @Melissa Miotke: Well, all I can say is that being outdoors is the first step. If you try it, most people like it. I wish you well in your adventures. I love being outdoors but mountain climbing is something I've never tried. I would love to do so someday. @anonymous: Thank you, glad you enjoyed it. @norma-holt: Thank you so much for your visit and featuring my lens. Your kindness and blessings are most appreciated. @aesta1: Always.....getting home is every bit as important as getting there. Thank you for reading and for your kind comments. Plan your exit. Great advice. @SheGetsCreative: Thank you for your kind comments. @AcornOakForest: Thank you very much. Yes, the memory of the "orange" stuck with me for many years and reminds me on occasion still, of the simpler things in life. I am happy my story kick started your own memory. After all, is it not our memories and experiences that define us. Thanks for the kind comments. I really liked your story. Your memory of the oranges is such a great detail... It reminded me of my own fond memory of the best watermelon I've ever tasted after a long canyon hike many years ago. Thanks for sparking the memory! A fascinating read. I really enjoyed reading your story. @OhMe: Yes, it was a great experience then and formed a focus for much of my life. My love of the outdoors. I do hope the trigger for your memories were positive. I tried not to paint them in a bad light at all, as their job was to keep us safe first and busy second. Cudos to you for your patience. Loved your Camp Story. What an experience for a ten year old. I worked as a camp counselor every summer when I was in college so could identify with some of your story. 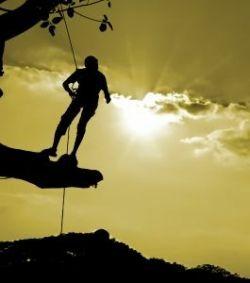 Great page and tons of experiential content about mountain climbing. Thanks for sharing! What a great story, I was right there with you, recalling some of the experiences I had a high school (aged 16) climbing a similar type of mountain in North Wales. Great story! I live not too far from there. 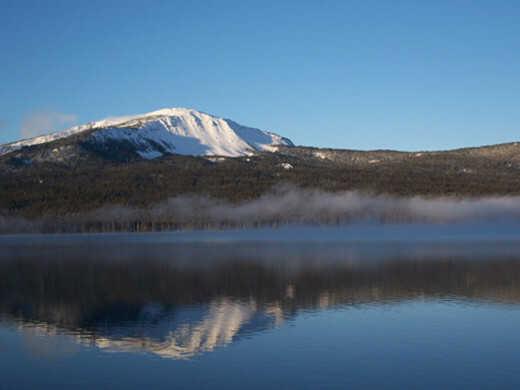 Now I want to go climb Mount Thielsen! I love the Umpqua National Forest, but I live in the Klamath National Forest. @annharrison85: You're very welcome, thanks for visiting. I can't wait to get outdoors!! Great story! Thanks! @Valerie Bloom: Well, thank you for taking the time to read and leave a comment. I enjoyed your story! Thanks for sharing. @askformore lm: Glad you found the information helpful. Thanks for your comments and your visit. @Tina4xy LM: I'm gld you liked this lens and I thank you for visiting. Nice story. I like how you write... it does inspire me to spend a little more time outdoors!